By default, all users within Rotageek are tagged as a 'User'. This means they will appear on the rota but do not have access to create or approve rotas. 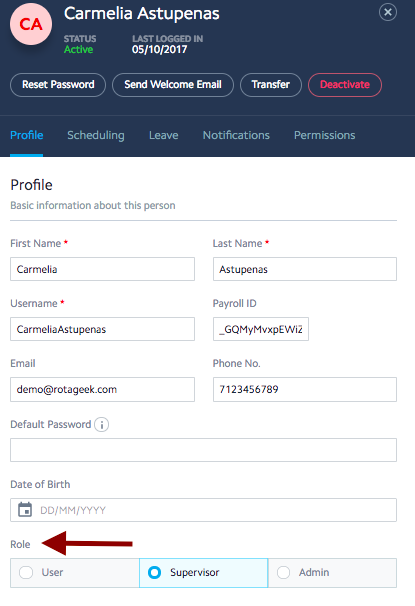 Most managers/store leads within Rotageek hold the position of 'supervisor' with access to administrative functions, including to create rotas on the scheduler. If you want to give someone else access to also create and approve rotas, navigate to the People Page and open the profile of the relevant staff member. Then change their 'Role' from 'User' to 'Supervisor'. After this they will have the default permissions of a 'Supervisor' in your organisation. 'Is able to: Approve on the scheduler' will allow them to approve and disseminate these rotas. 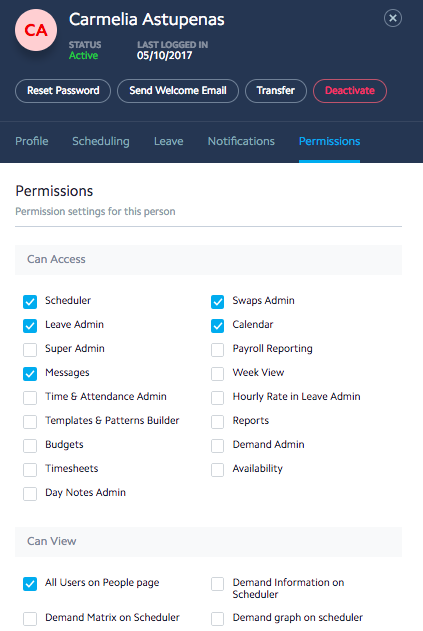 You can edit permissions by checking or unchecking the relevant boxes.